Easy Fruit Salad. Now that the warm weather is here, it’s time to start thinking about recipes to take to outdoor parties. 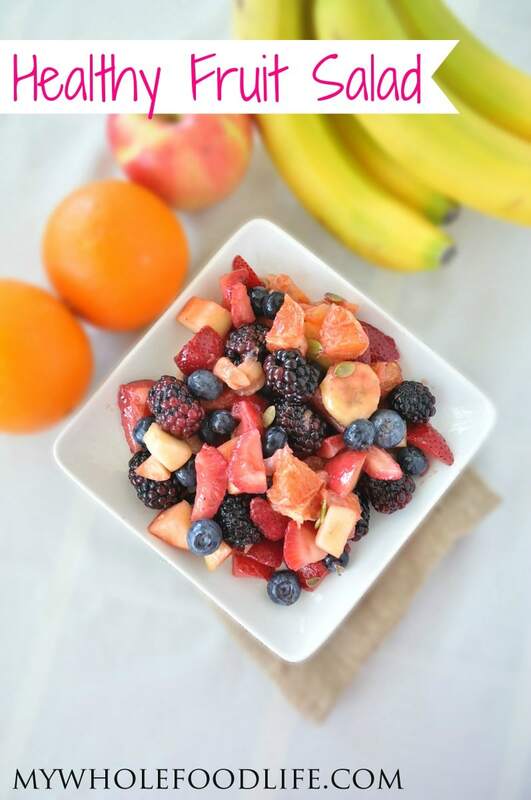 This easy fruit salad recipe is perfect for that. Normally, I do all the sweet recipes on the blog, but this easy fruit salad was created by my husband. He also created my dairy free potato salad and my cucumber salad. My kids loved this easy fruit salad. I hope yours will too! This fruit salad only takes a few minutes to make, so what are you waiting for? Perfect for Memorial Day cookouts. Add the fruit in a large bowl and pour the dressing over. Toss the fruit in the dressing coating the fruit in the dressing well. Thanks Becca! I am loving your carrot cake oats too! Oh good idea with the mint and chia seeds! We did add pepitas to ours. Sadly, people get more excited about the decadent desserts, but I am like you. I prefer the fruit. I just made this - it is in the fridge now. It is delicious - of course I had to sample it! And it is a pretty fruit salad as well - healthy and pretty. I will garnish with fresh mint from my garden when I serve it. Thank you for another great recipe. You are welcome! My husband will be happy to hear that you liked it. That's right - you did say he was the one who came up with this recipe - good job. You make a good team! Yes there is banana! I guess he forgot to add that in the directions. I will add that now. Just made this for a potluck party tonite. Absolutely delicious...I am sure it will be a big hit! :) Thanks!! My mom made this for my baby shower today. It was so good! I will definitely be making this myself!